Boil mangoes. Peel the skin and scoop the pulp. Add 1 cup water to the pulp and blend it. Take a pan and heat the syrup. Add sugar and boil it till sugar dissolves. Remove from the gas stove and let it cool slightly. Add cumin powder, salt, black salt and mix it well. If you feel the strands of mangoes in the syrup then strain it. Let it cool completely. Store this syrup in the bottle or serve it immediately. 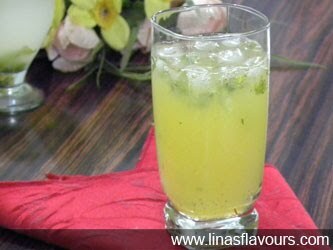 While serving add 2-3 tablespoon of syrup, lots of ice, finely chopped mint leaves, water, mix it properly and serve immediately.